Show your library love! 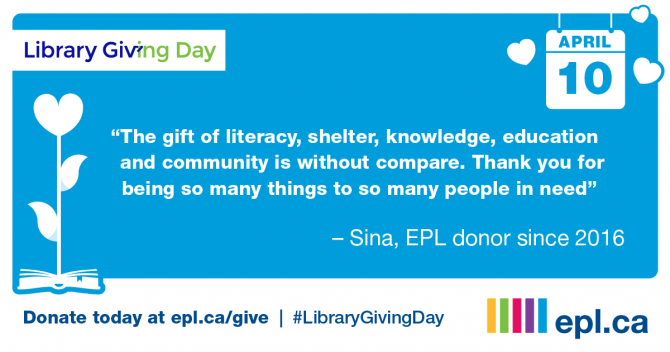 Support EPL with a donation on Library Giving Day this April 10, 2019. Library Giving Day started with the Seattle Public Library Foundation, and their concept to create a national day of giving that public libraries would rally around has become a reality! #LibraryGivingDay is a one-day fundraising event with the goal of encouraging people who depend on and enjoy public libraries to donate to their individual library system. In turn, that support will go toward the incredible programs, services and materials provided by local libraries across the country! We are currently working toward our goal of raising $10 million for our Stanley A. Milner Library, and we need your help to get there! Your gift to EPL for Library Giving Day will help us complete the revitalization of the downtown branch and provide more space for innovation, creation and learning to so many people.